To the new home of the Great Lakes Wooden Sailboat Society website. This site is dedicated to the preservation and enjoyment of wooden sailboats on the great lakes. 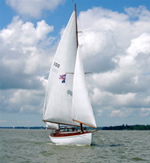 Within this site you will find examples of some of the finest sailing vessels ever built. These range from small "day-sailors" to larger cruisers. Many of these boats are 50-75 years of age (a few are even older). Look around and enjoy the old-world craftsmanship that make wooden sailboats so special. Come join us at the 'All Classics Weekend' Here. Wooden Boat magazine did a great article about the Yankee One Design class that our own Charlie Steigerwald owns one of! Check it out Here. We've had a mystery boat come our way - check it out Here.